Member Showcase - Random members sharing their talents in an effort to get to know each other better. Co-founder and signature member of Outdoor Painters Society, David Moreland Bates was born in Dallas, Texas, in 1940 and grew up in the Houston area. By the time he was in high school he knew he wanted to become an illustrator and, following two years of college, he was blessed with the opportunity to study at the Art Center School in Los Angeles (now the Art Center College of Design located in Pasadena, CA). After two years there he decided to meet his obligation of military service (as well as avoid the draft) and joined the U S Navy, fully intending to return to art school after his tour of duty. But sometimes life gets in the way of plans. 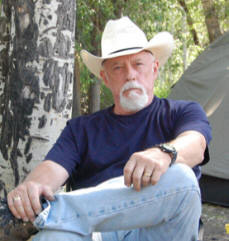 Using the skills he had learned in the Navy, Dave worked as a professional photographer until deciding in 1968 to make another change and study computer programming. He enjoyed a successful career developing business software until the mid-1990's when it was time for one more career change. This time he returned to the making of art. In 1996 he and Bruce Peil founded the Outdoor Painters Society, a group of plein air painters, and was instrumental in building it into a nationally recognized organization. 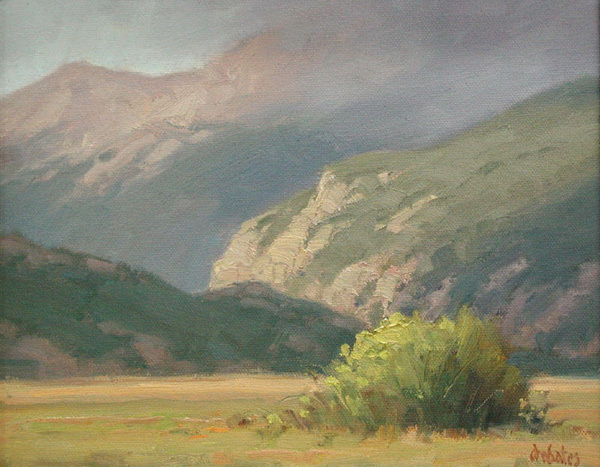 He is a Signature Member of both the OPS and the Oil Painters of America and his work has appeared in Southwest Art Magazine. Of his work Dave says, "Expressing oneself through art is a continually evolving process. When I began painting again, my main interest was in faithfully reproducing the beauty of nature. Later I focused on trying to reproduce and share with the viewer the effect on me of nature's subtle and changing moods. Lately I have been thinking about how to share those same feelings with less emphasis on recognizable shapes and more attention to color and value, using a minimum of shape clues. Of course, this has resulted in paintings ranging from fairly representational to very abstract, much different from my earlier work. Only time will tell where this will lead, but I hope it produces interesting and beautiful paintings that express my emotions in ways that others can share." Bruce was born and raised in Oklahoma and now resides in Athens, Texas. He is a signature member of the Oil Painters of America and the co-founder and signature member of the Outdoor Painters Society. 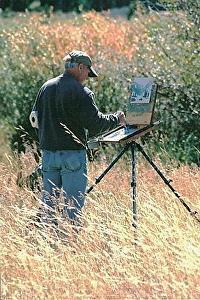 His paintings are in many corporate and private collections, and he is primarily known for his landscape paintings. "No matter what the subject matter is, it's that fleeting moment in time and the particular feeling of the light that I strive most to capture in my paintings. I want the viewer to feel as though they are experiencing that moment in time. My goal is to capture the truth about the subject without over embellishment of color or too many unimportant details that can distract the eye from the main idea. The light." "There are many artists who have influenced me and whose work I admire. Besides the obvious Sargent, Zorn, and Sorolla, there are artists like Wilson Hurley, Robert Lougheed, John Clymer, Clyde Aspevig, James Reynolds and so many more whose work had a big influence on me at the beginning of my art career. I discovered these great artists' paintings at the Cowboy Hall of Fame in Oklahoma City when I was first beginning to paint, which made their work very accessible. As a young artist, having access to paintings of this quality confirmed the direction I wanted my work to take and gave me a goal that I will always be striving to achieve. But as much as I admire these great painters work, my goal has never been to merely copy their style or technique, but instead to let my own style evolve naturally and to make my own statement. "